I wanted to share a few trains I saw recently. I parked near Diamond with my laptop at noon time on the 23rd, hopping out to shoot trains as they went by. Not a bad way to spend a noon hour. First up was CN 103, which showed up just as I arrived near Diamond. CN 2296 was the lead engine. CN 8837 was mid-train. Note the "new tire" on the rear of the truck. CN 8012 was pushing on the rear. About an hour later, the Canadian came rolling along. This was still a summer consist with 20 cars... not bad. ... and Illinois Central 1039 was behind her. I miss the black IC engines but this doesn't look too bad. I didn't realize they were meeting CN 199 until I noticed that CN 5619 had her headlights dimmed. I wasn't quite in the right place to catch the actual meet. Nice to see those BC Rail units still kicking around. The elevator was gone! I was shocked. I had driven by this elevator quite a few times over the years, and even stopped there once, but I had never photographed it. Now I can't. Here's a Google Street View from just about the same spot showing where the elevator was. It just goes to show you - shoot it while you can. Here's a nice photo of the former Parkbeg elevator I found on Flickr. Here's a video of the demolition, uploaded on September 6, 2011. Another grain elevator came down on September 4, near Winnipeg. It was the Paterson elevator at Marquette on the CP Carberry subdivision. Fortunately I did photograph this one. John over at the CP Rail Manitoba and Minnesota Subdivision blog wrote a great post on the demolition, complete with photos of the demolition. I've been photographing a bunch of elevators but there are so many more to see! After this disappointment, I returned to Mortlach for more trains. In the wake of the Lac-Mégantic disaster, many people have many questions. People are asking what traffic rolls through their communities, agencies are reviewing emergency response plans, people are wondering whether rail or pipeline transport is safer, new regulations were rushed out, and even the Canadian Senate was involved. In August, Omnitrax Inc., owner of the Hudson Bay Railway and the Port of Churchill, announced they were planning a test shipment of oil to Churchill for export. The plan was to ship 330,000 barrels* of oil to Churchill for loading on a tanker. About $2 million in upgrades to port facilities were required to increase the pumping capacity there. emergency response to a spill on the line could be very difficult as much of the line is in very remote areas. I just don't know whether it is a good idea or not. The railway needs the traffic but I think they need to provide some convincing assurances that it will be transported safely. The CBC is reporting that Irving Oil is shifting "away from rail to transport crude" and will be doubling the amount of oil they will be receiving by barge from Albany, NY. Currently they are receiving a shipload of oil from Albany via the tanker Afrodite every 8 days, and the article says this will double shortly with another ship being added to the route. The article is very misleading as it does not ask how the oil gets to Albany. Very likely it is being shipped by rail in the United States. Incidentally, I was quoted recently in the Portland Press Herald in regard to idle tank cars in Maine. * there is some confusion about whether the plan was for 330,000 barrels or gallons. Personally I can't imagine it was gallons because that's about 10 tank cars and hardly worth mentioning. Railway photographer Mark Perry photographed two of the CN slugs purchased by NB Southern in Winnipeg and gave me permission to post them here. Thanks, Mark! By the way, Mark has some great photos up on Flickr and a book. Check them out! Note the raised headlights on ex-CN 269, absent on 501. As I said before, the 2xx series slugs seem to be used for road service and industrial switching, not for humpyard work, so they need visible headlights for crossings. You can read about the slugs that NB Southern purchased. 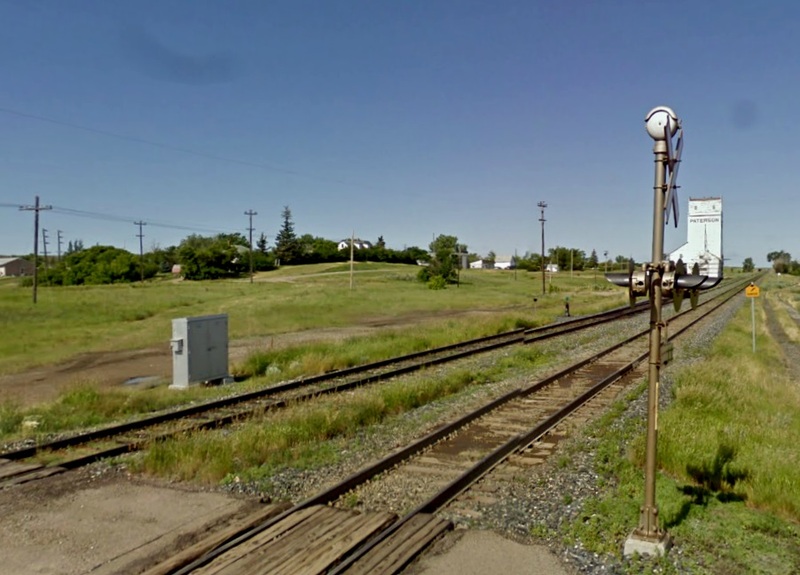 September 21-22: Winnipeg Railway Museum - Railway Days -10 AM-5 PM at the VIA station downtown at the corner of Main St. & Broadway, admission by donation. As well as the usual special displays by railway enthusiasts and vendors and SIG's, the new model railway layout enclosure will be operating. It's still a work in progress but quite impressive. All being well, the VIA Churchill train will be on display on Saturday, and a modern engine and caboose from BNSF Manitoba will be there both days. October 19-20: Manitoba Mega Train, sponsored by Vector Garden Trains and the Winnipeg Model Railroad Club. 9 AM-5 PM at 1871 Ellice Avenue (near the airport), admission $5, $3 for children 3-12, family pass $15/day. 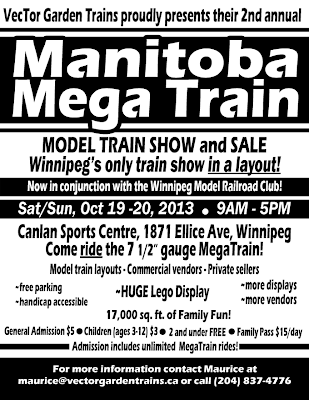 November 16-17: Selkirk Christmas Show, sponsored by the Selkirk Model Railroad Association. Selkirk, Manitoba. Details not available at this time. This summer we drove from Winnipeg to Banff to spend a week in the Rockies. We stopped in the Regina area going west and going east, and I took the opportunity to go see some trains while we were there. This post is from July 14. We were staying near Pense, SK about halfway between Regina and Moose Jaw. I set my alarm for "bright and early" because I wanted to maximize my time before I had to be back for other activities during the day. 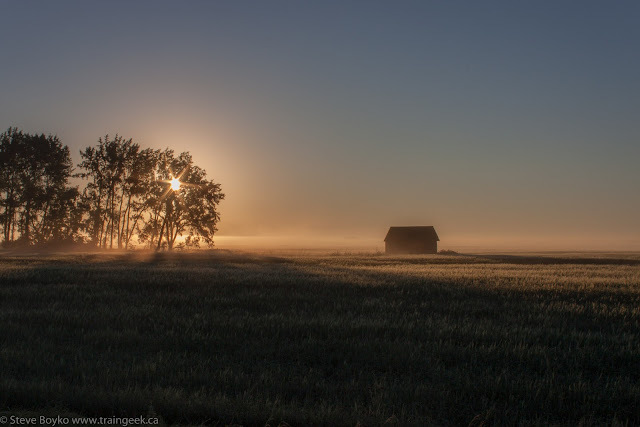 I stepped outside just after sunrise and the combination of the fog and the sun on the horizon made me get my camera out and start shooting before I even left the driveway. This is my favourite of the shots. Not bad, eh? If you like it, you can buy a print. I decided I wanted to shoot the grain elevators at Mortlach and Parkbeg, west of Moose Jaw, so I headed out on the Trans-Canada. At Belle Plaine one can sometimes see a train waiting for a meet, and sure enough there was CP 9719 and CP 5959 waiting in the fog. I didn't hang around. I carried on past Moose Jaw, pausing to photograph this modern Cargill grain elevator just west of the city. The canola was in fine form this year. After some more driving, I arrived in the small town of Mortlach. As Prairie towns go, it was quite nice, with two intersecting main streets and a few local businesses in the town. 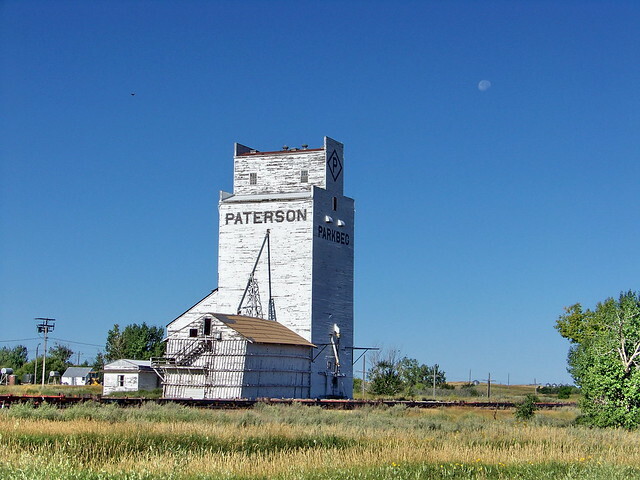 I found what I was looking for, the Paterson grain elevator. Unfortunately I missed the Saskatchewan Pool elevator, which was demolished in September 2011. The elevator had a few beat-up gondolas beside it. I found a big puddle from the rain the night before to use for a reflection. I took a number of photos and after about 10 minutes, I heard a horn in the distance. Soon CP 8773 East came rolling through. The mid-train engine was CP 8778. I have to share. That was a transcendent moment for me. Everything just lined up so nicely and I was so pleased with the photographs. I'm not a religious person but that was... spiritual. All right. After that, I decided to keep heading west to Parkbeg to shoot the elevator there... read on! NB Southern has purchased four CN slugs. The four are CN 251, CN 269, CN 501 and CN 508. Two are currently in Winnipeg (CN 269 and CN 501) and the other two are in Edmonton. The four were part of a long list of units for sale on CN's web site this summer. CN 251 was converted from a GP9 in 1990. CN 269 was converted from an MLW S3 in 1991. CN 501 and CN 508 were purpose-built as slugs in 1978 as CN 261 and CN 268 and were renumbered in 1990. You may recall that NB Southern bought a CN slug, ex CN 519, and it is now NBSR 008. I understand the four slugs needed some work before they were road-worthy. I don't know when they will be heading east but I expect it won't be too long. Personally, I've only seen CN 501 (my picture above), both times working the hump at Symington Yard here in Winnipeg. Two 5xx slugs are paired with two GP38s to work the hump yard. 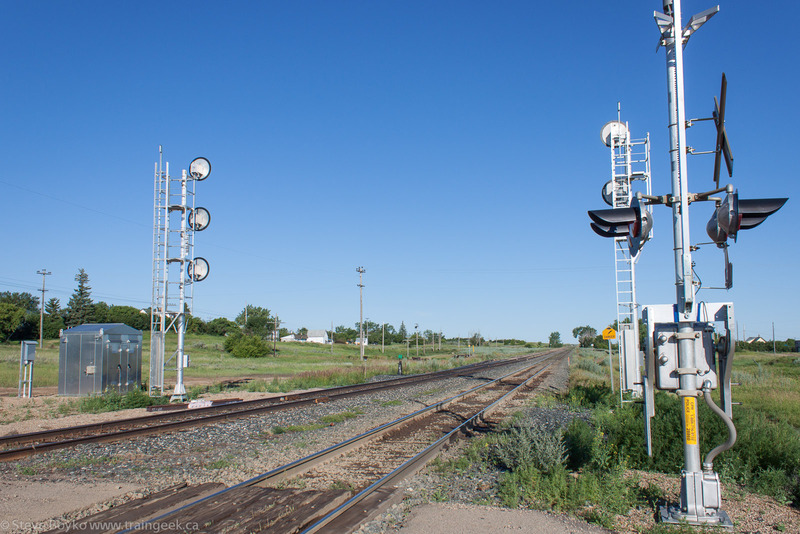 The 2xx units are usually paired with a GP9 or GP38 and work industries, as far as I have seen.